If one of your goals for the New Year is to get organized around the house then you need to start by tossing out a lot of things. This could mean some tough decisions ahead in terms of what you want to get rid of. There are two things might help make that decision process go a bit smoother. The first is that Junk King Orange County is standing by to help facilitate with the removal of any amount of unwanted clutter. The second, is that when you hire Junk King Orange County nothing you throw out is going to automatically be tossed onto a landfill. In other words, your stuff will go to waste. Getting organized means making room. In your closets, that’s could require deciding what outfits you want to keep. You may have some things in there that still have the price tags on that have been worn since you bought them. There could be items of clothing that you haven’t worn in several years. If you don’t see yourself in those outfits again, then they can go in the “toss out” pile. Your closet could also be where you’re keeping old laptops, cell phones, monitors and other electronics. Those also should be tossed out but only if they can be disposed of at a certified recycling center. Junk King Orange County will make sure those e-waste items are dropped off at those types of facilities. Moving out to the garage and find a lot of unused appliances, pots, pans, dishes, kitchen gadgets and other household items that would be better off dropped off at a charity. Keep in mind, that you don’t have to make the final determination as to what can go to a recycling center or to a charity. The crews working for Junk King Orange County have been trained to spot those particular items. They’ll sort them back at the depot and make sure they get to the right place. All it takes is one junk removal session with Junk King Orange County to get rid of all that unwanted stuff. That could even happen on the same day that you call to schedule your appointment. 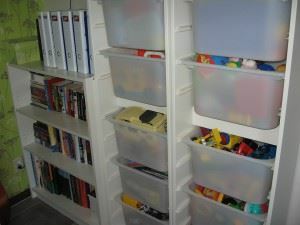 Your organizing can begin once Junk King Orange County finishes clearing out all your junk. This entry was posted in junk removal and tagged Junk King, junk removal, Organization on December 31, 2016 by Lee Turrini. Last updated August 14, 2017 .